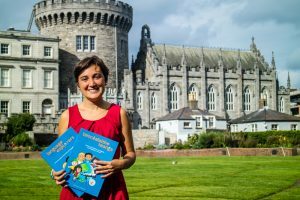 Join Mother Tongues founder Francesca La Morgia for the launch of her first multilingual activity book for children. The Language Explorers Activity book allows children to step into a world of languages and fosters their awareness of the diversity of languages that surround them. The book is a great resource for teachers in every school, and it is available in English and in Irish. Activities include word finding games, language hunts, writing in scripts from faraway lands, and exploring the treasures that can be found in the Chester Beatty Library. Dr Francesca La Morgia is Assistant Professor in Clinical Speech and Language Studies in Trinity College Dublin, and the coordinator of the Irish Research Network in Childhood Bilingualism and Multilingualism. Since 2006, her research has focused on child language development and bilingualism. Before joining Trinity, Francesca lectured in UCD, DCU and at the University of Reading, where she was also responsible for the English branch of Bilingualism Matters. She has been running workshops for bilingual families, teachers and other professionals for 10 years, and in 2017 she founded Mother Tongues, to offer these workshops and classes to a wider audience. Francesca has since been shortlisted for a number of national awards, including the Social Entrepreneur Awards and Ireland’s Best Young Entrepreneur.